NEW ORLEANS (AP) Right when it looked as if rising star Ben Simmons might lift the 76ers to an unlikely road victory, a guy that used to have Simmons’ job in Philadelphia took over in the clutch and rescued the Pelicans. 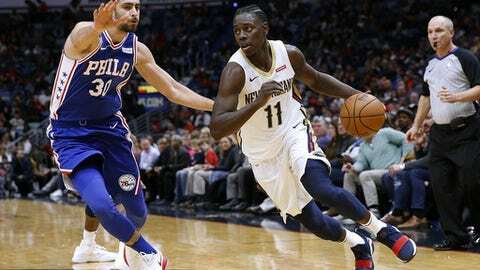 Jrue Holiday made five 3-pointers in the fourth quarter, when he scored 19 of his 34 points, and New Orleans overcame an eight-point deficit in the final period to beat short-handed Philadelphia 131-124 on Sunday night. The 6-foot-4 Holiday, an Eastern Conference All-Star in Philadelphia before being traded to New Orleans in 2013, struggled to create scoring chances on dribble drives against the 6-foot-10 Simmons, missing eight of his first 12 shots. He shifted his focus to passing out of his drives and committed five turnovers. Then Holiday opened the fourth quarter by letting fly quick 3s and changed the game. Simmons, who played one season at LSU before being selected first overall in the 2016 draft, had 27 points and 10 rebounds. He dazzled the crowd with a handful of explosive, driving dunks, including a reverse jam along the baseline that had the Sixers as close as 108-107 with 7:26 left. But Holiday and Davis responded with 3s to make it 114-107. ”Closing games out on the road is always difficult,” Sixers coach Brett Brown said. ”It’s especially difficult with DeMarcus Cousins and Anthony Davis and Jrue Holiday” on the other team. J.J. Redick, who had 28 points, hit a tough 22-foot jumper that briefly cut the Sixers’ deficit to five with four minutes left, but Holiday again responded with a 3, and his final 3 a couple possessions later gave the Pelicans’ an 11-point lead with 2:54 to go. Already without 6-foot-9 starting forward Robert Covington, the Sixers scratched 7-foot center Joel Embiid minutes before the game because of back stiffness. Still, Philadelphia outrebounded New Orleans 47-33 and outscored the Pelicans 60-44 in the paint. The Sixers snagged 22 offensive rebounds, which tied a season-high and led to 20 second-chance points. Pelicans: E’Twaun Moore had 14 points and Dante Cunningham 10. … Davis was called for a flagrant foul with 4:54 to go for lifting his elbow while setting a screen and hitting Simmons in the head. … Cousins’ playing time was limited when he was assessed his fifth foul with 9:33 left. … Reserve swing player Tony Allen dropped to the court in the first quarter before limping to the locker room on his own with what team officials said was a left knee injury. He did not return. Cousins said he persuaded coach Alvin Gentry to delay subbing him back into the game in the fourth quarter because he didn’t want to disrupt New Orleans’ surge into the lead. 76ers: At Minnesota on Tuesday night. Pelicans: At Houston on Monday night.